"I'm going to work hard, not to get elected, but to make Guelph and Ontario a better place. I want to earn your vote. "Watch Mike Schreiner's speech as he officially becomes the 2018 GPO candidate for Guelph. Hundreds of people came out to support GPO Leader and entrepreneur Mike Schreiner’s official launch of his campaign to be Guelph’s voice at Queen’s Park. BC MLA Adam Olsen told the crowd how only three Green MLAs have changed BC politics forever. Prominent Guelph Liberal Carolyn Weatherson told the crowd why she felt Guelph and Ontario needed Mike’s voice at Queen’s Park. Schreiner received nearly 20% of the vote in the last provincial election. He is poised to become Ontario’s first Green MPP by defeating long-time Liberal MPP Liz Sandals, a veteran member of the scandal-plagued McGuinty-Wynne governments. Mike Schreiner was elected leader of the Green Party of Ontario on November 14, 2009. Mike is a leading advocate for independent businesses, local food and sustainable communities. This will be his second time running in Guelph. Born in Victoria, Adam was raised on Tsartlip First Nation in Brentwood Bay, BC. He was recently elected as BC Green MLA in Saanich North and the Islands. Mike Schreiner’s submitted the following comment to the Ontario government’s update to the Nuclear Emergency Response Plan. Twenty-five nuclear reactors line the shores of the Great Lakes. 40 million people rely upon the Great Lakes for drinking water. 4.5 million people live within 50 KM of the Darlington and Pickering Nuclear Generating Stations. 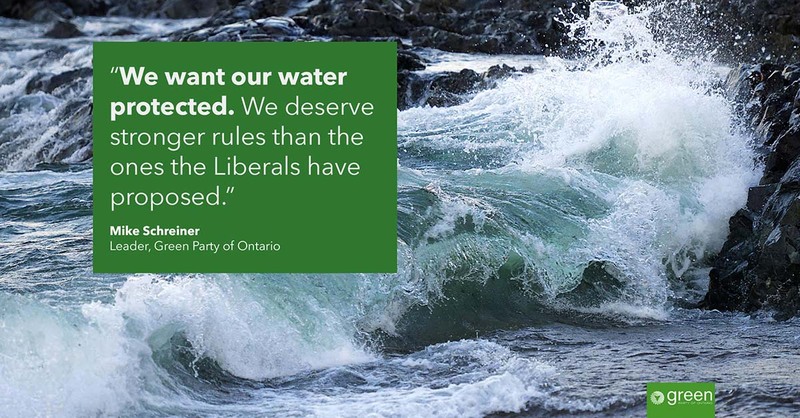 Protecting people and drinking water must be a top priority for the Ontario government. 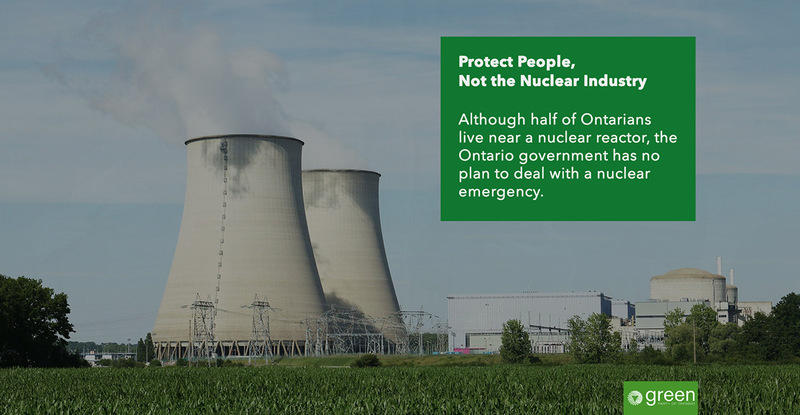 That’s why we welcome the Ontario government’s long overdue call for public input into updating the province’s inadequate nuclear emergency response plan. 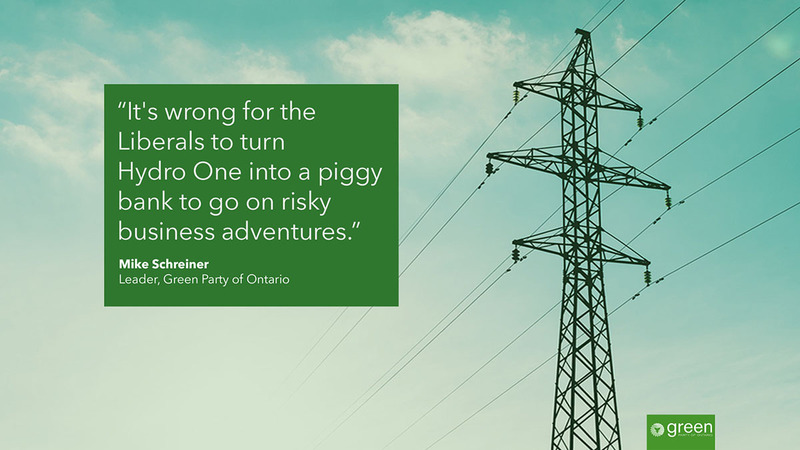 Unfortunately, the province’s nuclear emergency plans fail to protect the people of Ontario. It’s unacceptable that Ontario’s Discussion Paper on Provincial Nuclear Emergency Response Plan (PNERP): Planning Basis Review and Recommendations does not recommend strengthening emergency plans to international best practices in the wake of the Fukushima nuclear disaster. We believe it is irresponsible and reckless for your government to expose Ontario to the risks of a Fukushima scale (International Nuclear and Radiological Event Scale (INES) level 7) nuclear disaster without adequate emergency plans in place. It is inexplicable that in the wake of both the Chernobyl and Fukushima disasters the PNERP does not recommend updating and strengthening Ontario’s nuclear emergency response. Your government must act to put the safety of Ontarians ahead of the nuclear industry. Require the government to meet or exceed international best practices for nuclear emergency response planning and preparedness, by revising the PNERP. Instruct the Office of the Fire Marshal and Emergency Management (OFMEM) to upgrade Ontario’s reference accident from a INES 5 accident to an INES 7 accident to match the best practice set by Switzerland’s recent decision to make this change. Create a municipal, provincial and federal integrated emergency management plan that takes into account the possibility of a severe accident at an Ontario nuclear generating station, including multiple simultaneous reactor accidents. Implement emergency measures to improve notification and evacuation of residents, as well as mitigation of the effects of radiotoxic releases. Require the pre-distribution of potassium iodide (KI) pills to all residents living within 30 kilometers of a nuclear generating station and make KI pills available to anyone within 100 KM. Expand the detailed evacuation zone (the Primary Zone) to 20 KM and the secondary zone to 100 KM. Limit the construction of residences, schools, long term care facilities in the vicinity of nuclear reactors and nuclear waste storage. Adequately resource OFMEM to meet the provincial government’s constitutional responsibilities for nuclear emergency preparedness. Instruct OFMEM that it is neither reasonable nor prudent to rely exclusively on industry risk estimates for the selection of reference accidents used in determining off-site emergency measures. Independent experts and international best practices should guide OFMEM planning decisions. Require a plan to ensure safe drinking water in the event that a nuclear disaster contaminates the Great Lakes. Mandate that future updates to the PNERP Master Plan or Implementing Plans be posted to the Environmental Bill of Rights registry for public comment and transparent input from municipal councils. Your government is being negligent by failing to plan for worst-case nuclear accidents when half of Ontario lives in the shadow of a nuclear station. It is the government’s responsibility to protect public safety by making Ontario’s nuclear emergency plans the most robust in the world, or at the very least, in line with international best practices. Minister, I know you take your responsibilities seriously. It is time to do the right thing by strengthening Ontario’s nuclear emergency plans. You can submit your own comment via our easy form, due Friday July 28. “This move shows a privatized Hydro One won’t act in the public’s best interest, as Liberals were warned. Hydro One’s first move as a private company puts profits ahead of people’s health by buying a company that is a shareholder in coal-fired generation. Ontario has banned coal to protect air quality. Liberals and Ontario taxpayers lost control of this former public utility even before selling a majority of Hydro One shares. And Ontarians still pay the highest electricity rates‎. And the bad news doesn’t stop there. This purchase undermines the Liberals’ stated goal of reducing greenhouse gas emissions (GHGs). The Ontario Energy Ministry seems to suggest that the air pollution from the Avista coal plant is no problem, as long as the coal is being burned in Montana. Keep in mind: Montana borders British Columbia, Alberta and Saskatchewan, and air doesn’t respect national boundaries. In addition to the health impacts in western Canada, Ontario should be worried about the financial liability of acquiring coal plants. Guelph, Ontario – Excitement is building ‎in Guelph and throughout the province as Mike Schreiner launches his bid in Guelph to become the first Green Party member of the Ontario legislature. A strong turnout is expected for GPO’s Party in the Park: the party’s nomination meeting in Guelph on July 30. The event will feature live music, food and a keynote speech from BC MLA Adam Olsen on bringing the Green wave to Ontario. When: Sunday July 30, 2017 2:00 pm to 5:00 pm. Mike Schreiner will speak at approximately 3 pm. RSVP for our Party in the Park! Happy Canada Day 150+! Today we recognize the birth of a nation and the much longer history of First Nations, Métis and Inuit across this land. This Canada Day we celebrate our 150th year since the Confederation of 1867. This is not only a time for celebration. It is also a time for reflection–a time to reflect on the history upon which this country was built. The Indigenous origins of this land predates 150 years — by many thousands of years. The Indigenous story is an enduring one that predates and includes Canadian history. Ours is a land of many nations. We have much to be proud of as a country, such as opening our doors and hearts to welcome Syrian refugees. Over time, Canada has welcomed people from around the world. We’ve become a better, stronger nation because of our diversity. In celebrating our past and our diversity, we cannot afford to be blind to our history. In this province and across Canada, Indigenous people continue to lack access to basic human rights like clean water, decent housing, and quality health care. We must recognize that in building this country, treaties were broken, land was taken unceded, and rights not respected. Government programs like Residential Schools and Sixties Scoops have had terrible repercussions for generations of people. Today, we take the opportunity to reflect on this history, and look forward to the country we want to be in the next 150 years. Most importantly, we ask what we can do today to shape that future for present and future generations? Today is a time to confront the truth and continue the conversation about how to foster reconciliation among the nations of this land. Canada can be a place that honours Indigenous rights and learns from the wisdom of Indigenous elders on how to be stewards of this land for the next 150 years–protecting it for the benefit of the next seven generations. I sincerely hope that Canada 150 is a moment in history to celebrate the shared values that bind us–respect, truth, compassion, justice and a deep and abiding love for this land and the people who share it. In the spirit of reconciliation, we have hard work ahead of us as we try to achieve these values in action. I’m confident Canada is up for this challenge. With this as our starting point, on behalf of the Green Party of Ontario, we wish everyone a Happy Canada 150+! Today, Muslims around the world mark the end of the holy month of Ramadan with Eid al-Fitr, signaling a break from a month-long fast. This fast engages Muslims in the tenets of their faith, including charity, compassion, worship, and spiritual renewal. As the Muslim community in Ontario, Canada, and across the world join friends and family in feast and celebration, it is important for all of us to honour the values that the Islamic religion holds dear and to build bridges among people of all faiths. We must also use this moment to consider the millions of Muslims around the world who may not be able to enjoy a safe and comfortable celebration in their homes and countries at this time. Keeping them in mind, we extend our wishes of peace and good health to them and their loved ones. Standing in solidarity with Muslim communities at home and abroad, we can all take this opportunity to practice our shared values of compassion, service, generosity and community. On behalf of the Green Party of Ontario, Eid Mubarak to all! (Toronto, ON) – A recently-passed amendment to the provincial Oil, Gas and Salt Resources Act may open the door to fracking in Ontario. Jurisdictions like New York, Quebec, New Brunswick and Nova Scotia have already passed bills to ban hydraulic fracturing due to health and environmental concerns. Although no hydraulic fracking for shale gas currently exists in Ontario, the Liberal government has in the past provided mapping data to assist in exploration for the fracking industry. Plus, the Ontario Liberals have so far refused to ban the practice. In Canada and the US, fracking is linked to increased earthquake frequency, high methane emissions and risks to drinking water. These not only risk our health and environment, they undermine our efforts to reduce greenhouse gas pollution. Ontario should ban fracking before these threats become real. Schedule 23 of Bill 127, the Stronger, Healthier Ontario Act (Budget Measures) amends the Act to say “The Oil, Gas and Salt Resources Act is amended with respect to the regulation of compressed air energy storage projects prescribed by the regulations and of projects that involve the injection of substances into underground geological formations”.Because fracking isn’t specifically excluded from the amendment, the Liberal government has left open the possibility of fracking in Ontario. Fracking is linked to earthquakes in the US and Canada. Tell Kathleen Wynne that Fracking Isn’t Welcome in Ontario, by Mike Schreiner via Huffington Post. 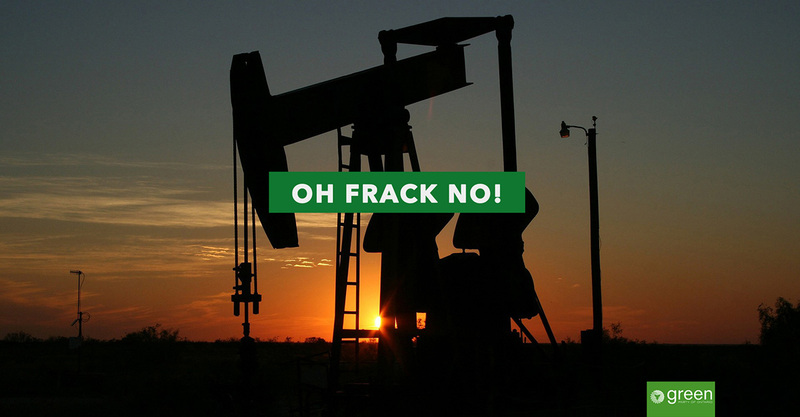 Support a ban on fracking by sending a letter to the Premier. First Nations, Inuit, and Métis people each have their own unique heritage, language, and culture. Today, on National Aboriginal Day, we celebrate the important contributions that these communities have made to Turtle Island and this place we call Canada. Now more than ever we need to apply an indigenous worldview to the challenges we face. We can learn from the wisdom of indigenous elders on how to defend the land and water that sustains us. And we must make decisions today that ensure a sustainable future for the next seven generations. Each year on this day, governments pledge to work closely with indigenous communities to reconcile issues of the past and commit to promises for a better future. However, in this province, Indigenous people continue to lack access to basic human rights like clean water, decent housing, and affordable electricity. This is unacceptable in a province as prosperous as Ontairo. The crises witnessed in Attawapiskat, Grassy Narrows and other indigenous communities across our province cannot be ignored. We must act now to address issues facing Indigenous communities. The government has an obligation to work with indigenous communities – with full partnership, participation, and respect – to make sure everyone in Ontario has access to high quality health care, education, and economic opportunities. The Green Party of Ontario has and will continue to work with First Nations leaders to protect the land and drinking water both within indigenous communities and across the province. We have so much to learn about sustainability from our indigenous sisters and brothers. And we must act on their wisdom. “The annual flag raising ceremony at Queen’s Park today is a joyous occasion. I am reminded that Pride month’s festivities are a celebration of the diversity of our province as we continue to strive for equality for all Ontarians. Pride offers us an opportunity to remember those who have come before us, and pay tribute to those who fought tirelessly for the rights and freedoms we enjoy today. We should be proud of how far we have come on our path toward acceptance and inclusivity, but we are not there yet. While members of our community continue to feel oppression we must continue the march toward inclusivity so that all members of our society may feel safe and accepted. We must ensure that all families are treated with respect and equality under the law. We must ensure that all parents have equal rights and all of our citizens have equal job opportunities under the law of the land. It is especially important that our children grow up in a society that respects everyone equally. And this is just one of the many reasons why the GPO continues to speak out for human rights, for students, teachers and parents in our school system. It remains an unacceptable truth in 2017 that some schools funded by Ontario taxpayers discriminate against the LGBTQ community through hiring practices. We must continue to push for political change that promotes inclusivity and human rights for all Ontarians. March with us at the 2017 Toronto Pride Parade – RSVP here for details. Our water must be protected. Thousands delivered this message at Waterstock to demand stronger protections for water—water is for life. Everyone should have a right to clean drinking water. Your government’s proposed new water taking regulations fail to put water for people first. You’ve let down the thousands of people who wrote your government asking for stronger protections for public drinking water. The people of Ontario deserve better. I urge you to manage our water as a public trust in the public interest. Public drinking water for communities should have priority access to water over commercial and industrial users. Your Ministry recently made some changes that amount to a small step in the right direction. But more must be done. To start, Permit To Take Water (PTTW) rules should establish public drinking water for communities as the top priority. Your own Ministry, as well as the Environmental Commissioner of Ontario (ECO), has acknowledged that climate change will likely lead to more droughts that cause water shortages. Restrictions on water taking will likely be necessary under these conditions. Restricting public access to municipal water should not happen without first restricting private access for commercial and industrial users. Even the possibility that people would be forced to buy water from a private company because public drinking water is not available is unacceptable. Quarries and bottled water companies should face mandatory restrictions on water taking during droughts. Their water taking permits should be restricted, revoked or denied if science reveals water shortages. Minister, I ask you to make it explicitly clear in law that water for public drinking and growing food has priority over all other users when issuing a PTTW. Now is the time for the province to establish clear guidelines for priority access to water taking permits. It is irresponsible for your Ministry to wait until there is a crisis. I am also deeply concerned about the new water taking fees for water bottlers. I have strongly advocated for an increase in water taking fees, but believe such an increase should be based on science, data and best practices. The Ministry should set the fee based on a cost recovery rate. The fee should not be too high to avoid treating water as a commodity for a government cash grab. Nor should the fee be too low so that taxpayers continue to subsidize commercial water taking. Your Ministry has not shared any data on why the new rate is set at $503.71 per million litres. This is still a drop in the bucket for bottlers who retail a 500 ml bottle at convenience stores for $2 but only have to pay $0.0005 for a litre of public water–water that is taken out of our watershed and shipped elsewhere to be sold for profit. It is critical that the water taking fee is set at a level that properly funds water management programs. The ECO has for years raised concerns that water management programs are underfunded. As well, a portion of the water taking fee should also help fund sustainable water management for municipalities. Once proper funding is in place to manage water sustainably, you should establish water taking fees at a rate that covers these costs. Finally, your Ministry must take action to reduce plastic pollution and the cost associated with disposing/recycling plastic bottles. I understand that plastic pollution is outside the scope of revising water taking rules, but it is short-sighted to have any discussion of revising the rules for bottled water without also reviewing ways to eliminate plastic pollution. Minister, now is the time to do the right thing for the people of Ontario. Put people and public water first. We want our water protected. And we deserve stronger rules than the ones you have proposed. Support stronger protections on our water by sending a letter to the Minister here.